Companies often think of export or global sales in the context of incremental revenue. That's a seductive story when one considers that 95% of the world's buyers are outside the US. But for companies that are doing "well", or even "OK", simply adding more sales may not be enough to move the needle. Nearly every company I've seen successfully export has started off planning to sell their product internationally (often simply referring to internet inquiries) and very quickly developed versions and use cases from observing overseas application. Those new insights often create entirely new market opportunities domestically, adding benefits from diversification, incremental revenue and often reduced competition in new application areas. Taken several steps further, in this interesting case a company created a product concept and floated it to the world to see which markets would embrace it. They then took lessons learned to adapt it for broader appeal. It seems likely that shifting political winds in the US will lead to lower taxes on both corporate profits and the "pass through" (SCorp & LLC retained earnings) income of small business owners. That may reduce, but likely not substantially change the calculus of the tax benefits of an IC-DISC structure for handling profits from export (direct and often even indirect) sales. You've heard all about how tough millenials supposedly are to recruit, manage & retain. Everyone agrees they want to feel like they're making a difference and they want to be engaged. Here's a perfect opportunity to appeal to, and challenge this generation that was raised with a global mindset. By selling internationally you will open up opportunities for global sales, research, design, marketing, administrative, finance, support, logistics and legal. Putting aside the political hot potato of immigration, the US is already home to a substantial Latino population. But marketing and selling to a "Cuban" in Miami is just as different from selling to a "Brazilian" in Framingham, MA or a "Honduran" in Houston as selling to a Yankee in Boston and a Hipster in Seattle. 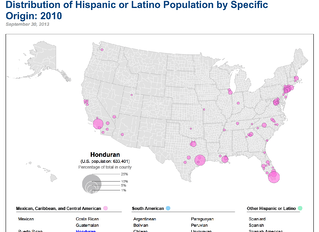 This neat tool from the US Census let's you identify pockets of population density by LatAm nation of origin. It's simply not enough to have American English and some monolithic "Spanglish" approach to marketing to the rapidly growing Latino market in the US. Instead it's important to understand that there are distinct segments - geographically, by nation of origin, culture, language and dialect. The best way to learn more about each is to become expert in marketing to people in the nations of origin. Get really good at reaching Colombians in Bogota, and you'll learn lessons that will make you vastly more effective reaching their counterparts in NYC. Every market and industry has good times and bad. And while global markets experience similar trends, the magnitude and timing varies. Additionally fluctuating currencies and demographics mean that different markets experience up and downturns to different degrees at different times. US Department of Commerce research has found that companies that export both pay higher wages and are more resilient. In an Amex Insight Guide packed with case studies, several successful exporters discuss how their global sales saved their businesses during the 08-09 recession. "So" you may be saying, "it all sounds pretty groovy but I've heard what a colossal, risky, expensive and frustrating undertaking growing global markets can be. I'm not interested." The point is that the risk is essentially removed. Want to learn how to turn your domestic digital marketing into global sales....and then to realize these five benefits of exporting? Download this free guide that lays it out step-by-step.